The following two locomotives are plinthed at the North West Transport Museum at Klerksdorp. The Transport Museum was opened in 2006 and is located near Dawkinsville at the old goods sheds of the railways. The museum is well worth a visit - pictures of the some of the exhibits may be seen here. Photo taken 21 October 2006 by Awie Visagie. "The year 1930 saw the appearance of the first of an outstandingly successful design. This was an 0-8-0 side tank with 18 in. x 23 in. outside cylinders and 3 ft. 6 in. coupled wheels which was built for the 3 ft. 6 in. 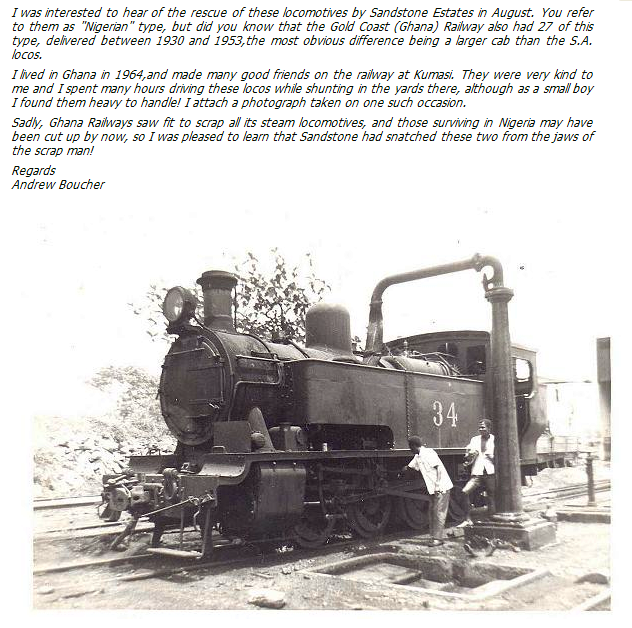 Gold Coast Railway (located in present day Ghana). " "With a weight in working order of 48 tons 8 cwt., this was a powerful little locomotive giving a tractive effort figure of 23,532 lb. at 75% boiler pressure. 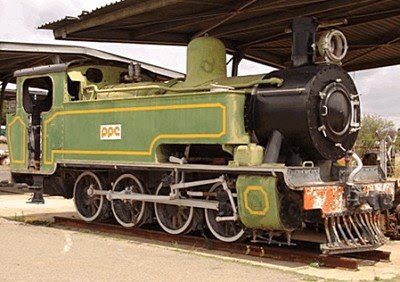 Successive repeat orders over the years have brought the total of these engines built up to fifty-seven, twenty-four for the Gold Coast and thirty-three for the Nigerian Railways." 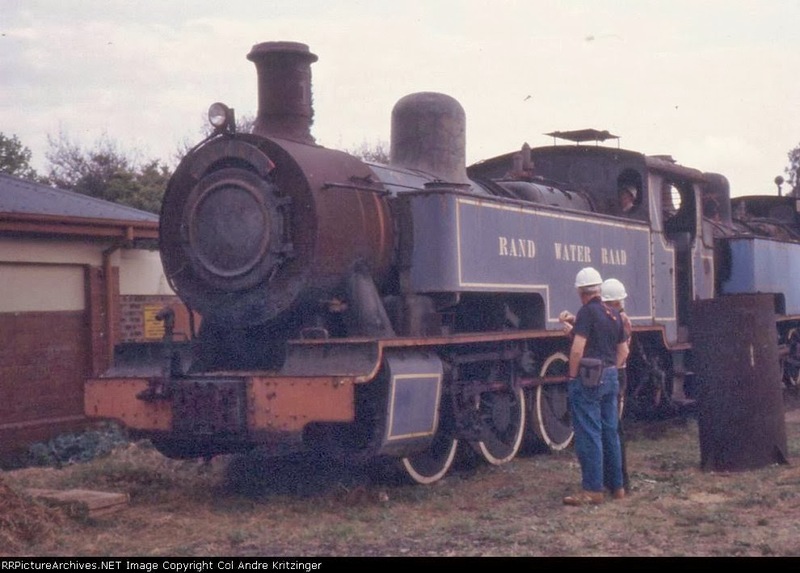 "The last batch of 6 engines built for Nigeria in 1955 differed from their predecessors in having eight-wheeled tenders in addition to the 1000 gallon side tanks, thus bringing the total water capacity to 4,800 gallons." 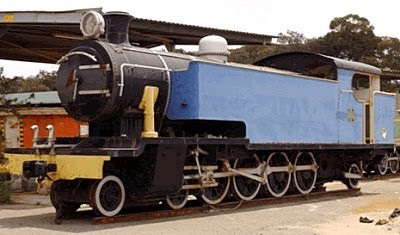 Based on the same base design as the steam locomotives delivered to the Gold Coast and Nigeria, four slightly different looking 0-8-0 side tank engines were delivered in South Africa. 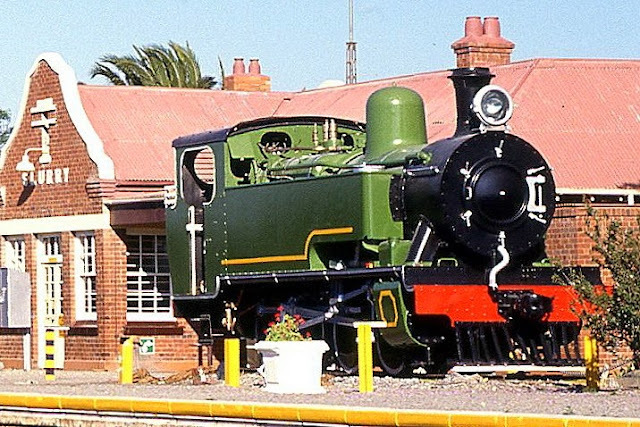 The South African version had smaller cabs and smaller smoke box doors. In 1938 PPC (Pretoria Portland Cement Co Ltd.) PPC received 2 new Hunslet locomotives - "No. 1" = HE 1892 and "No. 2" = HE 1900. 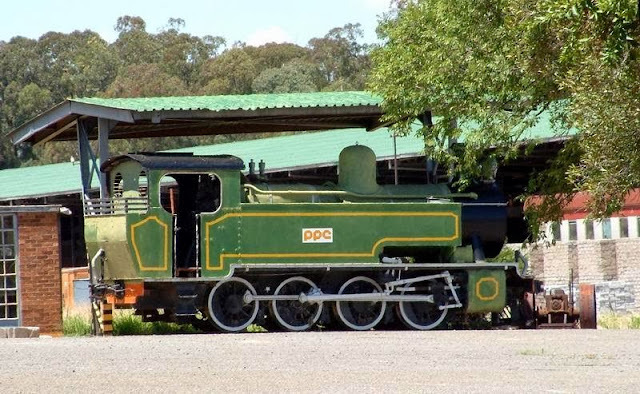 PPC "No 1" was scrapped many years ago, but PPC No 2 was plinthed on the Slurry station platform near the "Works No 2" cement factory at Slurry, 20 km east of Mafikeng. Also in 1938 the Rand Water Board start using one of these locomotives on their 5km branch line to the Swartkoppies pumping station. The pumping station was coal-fired at the time. In 1946 a 2nd Hunslet 0-8-0T was delivered new to RWB. A couple of images of the RWB branch in operation in 1980 may be seen here. Eventually these locomotives became redundant -- image: André Kritzinger. 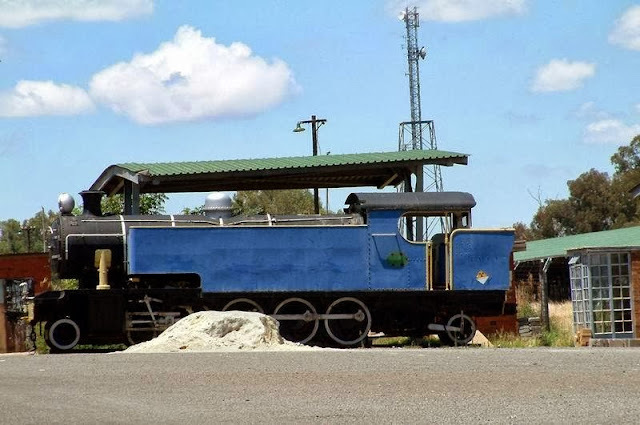 This locomotive was donated by Anglogold Ashanti to the North West Transport Museum in Klerksdorp. One of the gold mines resorting under Anglogold is Vaal Reefs - see below. A sister of this NBL locomotive may be seen at the Florida Junction shopping centre in Roodepoort.